My taste in motorbikes often runs towards the hooligan side of the street – such as my ’07 Speed Triple SE – but I also have a long-running love affair with comparatively “sensible” Boxer-engined Beemers, ever since I rode a buddy’s yellow R90S cafe racer many years ago. Lately, I’ve had my eye on a black and green Rockster around the corner at MotoJava – seems like it’d be a perfect 2-up city bike. 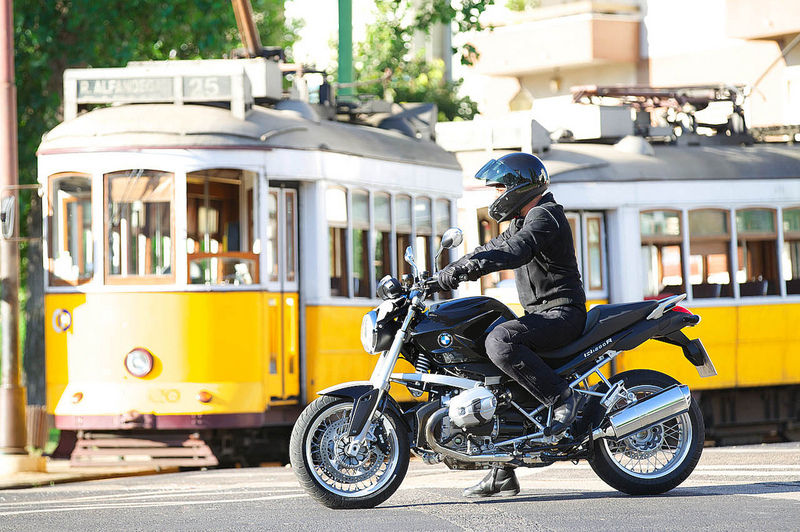 I wasn’t too excited when I heard there were mild updates to the R1200R for 2011, until I got a load of the R1200R Classic over on Hell For Leather. That’s right – chrome spoked wheels and black paint with white accents gets me every time. And the bike has had decent real world horsepower (110 hp and 88 ft.lb of torque) for a couple years or so now, although I have heard some significant complaints about the reliability of the 1200 engine. Very un-BMW! I disagree, though, with Hell For Leather’s characterization of the BMW roadster rider as a slipper-wearing, pipe-smoking traditionalist, complete with monocle. Granted, this isn’t the bike for popping block-long wheelies and screaming from stoplight to stoplight with the back tire in flames, but I think it’d make a perfect San Francisco urban assault vehicle. Throw some heated grips and a top box on there, and you’re good to go. Tractable power and a reasonably slim albeit not-so-girlish figure make for an awesome lane splitter, and it should handle well enough to make weekend jaunts down the coast plenty of fun. Yes, please. 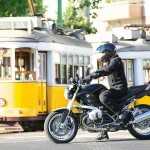 New 2011 Triumph Speed Triple Photos. Me Likey. 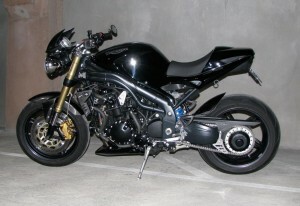 One of my favorite modern motorcycles is the Triumph Speed Triple. I like ’em all, but my favorite generation is the 2005-2010 1050 cc model. I had a 2007 Special Edition, and it was an amazing motorcycle. It was set up just right, and that Arrow pipe had a real nice growl – not insanely loud, but nice. I regret selling it every time I see a Speed Triple on the road. My 2007 Triumph Speed Triple Special Edition. We wants it, we needs it. Must have the precious. Hell For Leather posted some photos today of the 2011 Speed Triple and I spent a good long time drooling over ’em. I like the new bike, in fact I like it a lot. But… I think I still like the ’05-’10 – or at least my ’07 SE – more. The new S3 is pretty muscular looking and has a bit more go-juice (7 more ponies and 6 more ft/lb of torque) to back up that look but so far I think I prefer the look of the current frame over the new version. Also, although the headlights aren’t as bad as some of the other more “transformer-y” styled bikes of the last couple years, they look wrong to me. I love the round “bug eyes” that have until now been one of the hallmarks of the S3. Check out the ridiculously named new Thunderbird Storm; dual roundies are still ok in 2011 – why not keep ’em on the original bug-eyed street fightin’ bike? There’s no doubt in my mind that this new S3 is gonna be a sweet bike, but I think I’d prefer to get my hands on another ’05-’10 to set up like my ’07 SE.